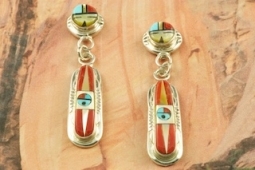 Beautiful Zuni Sun Face Design featuring Genuine Red Coral set in Sterling Silver Post Earrings. Accented with Genuine Sleeping Beauty Turquoise, Gold Lip Mother of Pearl and Jet. The Sleeping Beauty Turquoise mine is located in Gila County, Arizona. Created by Zuni Artist Rayland and Patty Edaakie. Signed by the artists. The Zuni Pueblo is located in New Mexico, Land of Enchantment. Look at the bottom of the page for matching pendant! Earrings are 1 7/8" L x 3/8" W.